Citizen of the world because of his status as a musician and Parisian at heart, Moh ! Kouyaté shares his vision as a wise African in his second album, Fé toki. Here, Moh’s art is connected to the whole planet. His voluble guitar produces all kind of styles, riffs or solos in a Congolese style combined with rock and roll heroic flights. Yet it is from Conakry that the singer draws inspiration. His songs continue the epic tales of music from Guinea. In the wake of the Mandingo blues, Moh ! makes us travel from the banks of the Niger river to the heart of African-American music. And yet,even if he takes his inspiration from the rumours in the world, he never departs from the wisdom of a griot (djéli) whose function, transmitted in the family, aims at uniting the Mandingo society. The message of Fé toki is that it is always a matter of opinion. Work, sharing, success or gossips, let relativity guide our judgment, our action turn towards positive purposes. In Fé toki, Moh ! 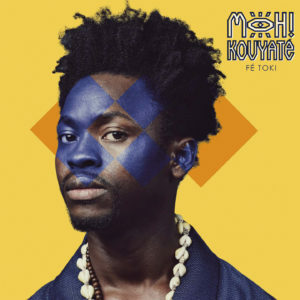 Kouyaté gives us unambiguous words while entertaining us with his magnificient music.